Provides centralized management and monitoring of the networking configuration of all hosts that are associated with the switch. In vSphere Standard Switch contains data plane and management plane individually. 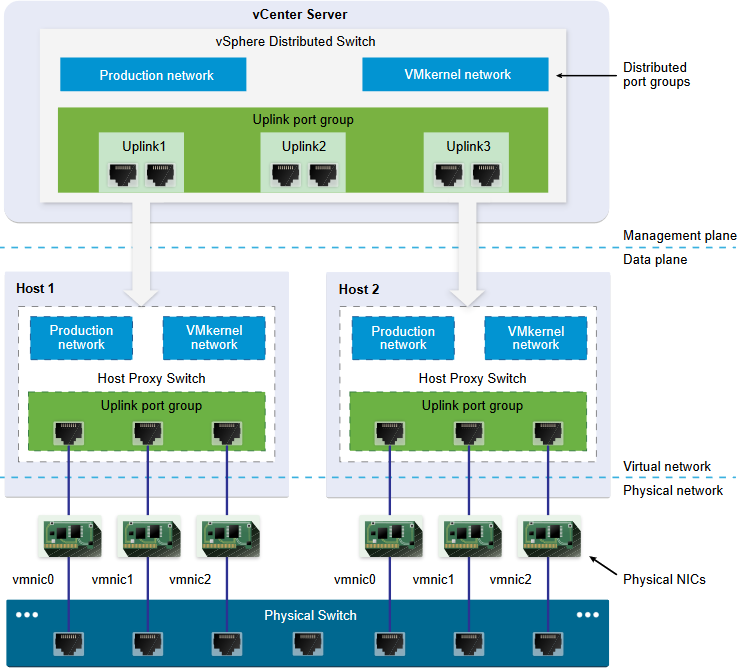 In vDS the data plane remains locally on every host that is associated with the distributed switch, and management plane is centralized per vCenter. Distributed Switch: 6.0.0 –> Compatible with ESXi 6.0 and later. Distributed Switch: 5.5.0 –> Compatible with ESXi 5.5 and later. Features released with later vSphere distributed switch versions are not supported. Distributed Switch: 5.1.0 –> Compatible with VMware ESXi 5.1 and later. Features released with later vSphere distributed switch versions are not supported. Distributed Switch: 5.0.0 –> Compatible with VMware ESXi 5.0 and later. Features released with later vSphere distributed switch versions are not supported. In Name and Location, type a name for the new distributed switch, or accept the generated name, and click Next. To add hosts to a different distributed switch, you can use the Add and Manage Hosts wizard to migrate the network adapters on the hosts to the new switch all together. 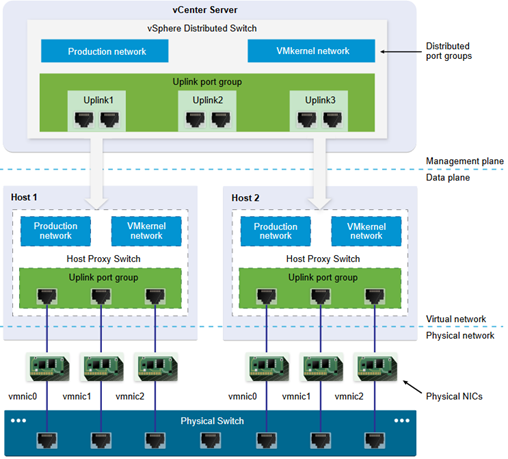 A distributed port group specifies port configuration options for each member port on a vSphere distributed switch. Distributed port groups define how a connection is made to a network. Ephemeral –> No port binding. You can assign a virtual machine to a distributed port group with ephemeral port binding also when connected to the host. Netflow (enabled/disabled) –> provides the ability to collect IP network traffic as it enters or exits an interface. By analyzing the data provided by NetFlow, a network administrator can determine things such as the source and destination of traffic, class of service, and the causes of congestion. Select a distributed switch and click the Related Objects tab. Required privileges: Network > Assign network on a network. In addition to connecting virtual machines to a distributed switch at the individual virtual machine level, you can migrate a group of virtual machines between a vSphere Distributed Switch network and a vSphere Standard Switch network. Manage large environment: using dVS is possible to span switch modifications across multiple hosts using a single “action”.